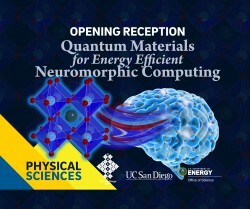 Join us to celebrate the opening of the Quantum Materials for Energy Efficient Neuromorphic Computing center, headquartered here at UCSD Physics!! Part of the U. S. Department of Energy’s “Energy Frontiers Research Center” (EFRC), the new Quantum Materials for Energy Efficient Neuromorphic Computing, Q-MEEN-C, is kicking off its inaugural meeting with an opening reception at its UC San Diego headquarters. After the reception, which will include talks from 52nd District Representative Peters and Q-MEEN-C Director Schuller, 19 national and international researchers will participate in a two-day workshop drawing principal investigators, postdoctoral scholars and students who work on EFRC research. For UC San Diego’s EFRC researchers that means exploring novel quantum materials as platforms for brain-inspired, highly energy-efficient computing. Please help welcome the new center to campus with this introductory celebration! Light refreshments will be served.